Last week, President Trump met at the White House with corporate executives he had invited to advise him on business and economic matters. In the days leading up to the meeting, one executive -- Uber's Travis Kalanick -- came under heavy pressure from some consumers to withdraw from the group. There was even a #deleteuber campaign on social media, threatening a boycott if he attended the meeting. The day before the meeting, Kalanick bowed to the consumer pressure and told Trump he would not be part of the group. Interestingly, however, most of the other executives taking part of the meeting got little or no consumer pushback. The CEOs of IBM and General Motors, for example, took part with no ill consequences. So what was the difference? Could it be that Uber's customer base tends to be young, urban, politically liberal, and determined to delegitimize a Trump presidency? Could it be that these consumers don't really use IBM or GM products very much, don't identify with them, and don't hold these companies to the same standard? A new Harris Poll suggests there could be something to that. It found that consumers tend to want the values of the companies they patronize to align with their own. Republicans tend to favor Chick-fil-A and Hobby Lobby for that reason. Democrats tend to look more favorably on Target and Starbucks. 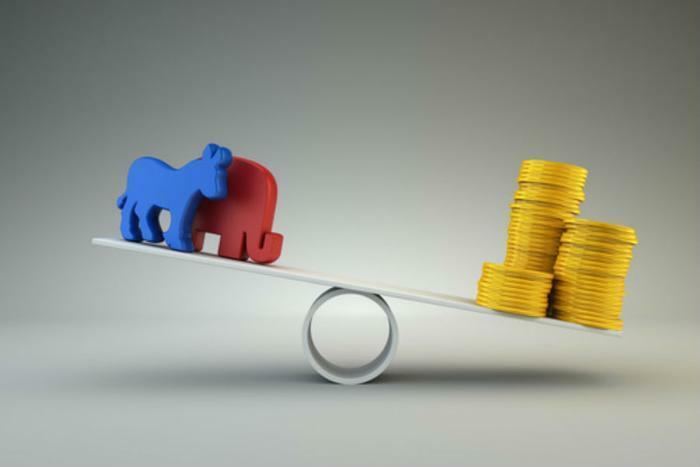 "In such divided times, as companies scurry to figure out if and how to respond to the issues and commentary of the new administration, we find that corporate reputation perceptions can be just as polarizing," said Wendy Salomon, vice president of reputation management and public affairs at The Harris Poll. She says companies that take very public stands for their values are usually rewarded by their customers who have the same values. Starbucks, for example, has been one of the corporations that has spoken out vigorously against Trump's executive order blocking immigration from seven Middle Eastern countries. Apple is another. Salomon says these companies stand to be rewarded by their like-minded customers, but risk alienating consumers who hold opposite views. But if a company believes its base is overwhelmingly liberal, it is more likely to take a liberal public stand, and vice-versa. Here's what the poll found: Chick-fil-A scores highest among Republicans than any other company, with Republicans liking it 17.4 points more than Democrats. Target, on the other hand, scores 11.8 points better among Democrats than Republicans. "Values play a bigger role than ever before in corporate reputation, and the business significance of a company's reputation has never been higher," said Mark J. Penn, managing partner and president of The Stagwell Group LLC, which owns The Harris Poll. He adds that consumers are now more interested than ever in how companies engage with the world. As the country becomes more polarized, he says he expects businesses will do the same.